Open to the Public 6 days a week from 6:00 a.m. to 6:00 p.m. Course closes at 8:00 p.m. Golf course will be closed to the public every Monday except for holiday weekends. Welcome to the White River Golf Club! 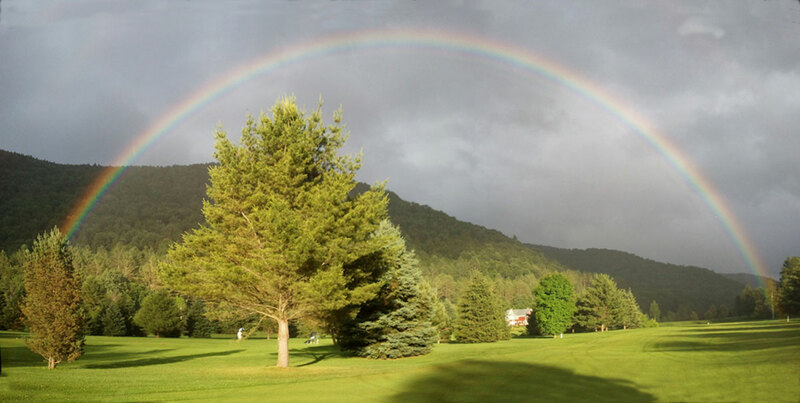 Imagine playing golf in a remote and secluded location deep in the heart of the Green Mountains.. If you can, then you need to play at White River. The pictures on this website can never accurately portray the pristine landscape that surrounds this nine hole golf course. The most common statement by golfers that have played the course for the first time is "I cannot believe how beautiful it is out there!" Completely renovated in 2012 this course is a great venue for everyone. The 2019 Season will be my 23rd year of owning and operating the White River Golf Club. I've watched those 5 foot saplings grow into 40 foot mature trees that now squeeze the fairways into narrow corridors. Consequently, this course rewards accuracy and penalizes errant golf shots. Despite it's challenges and despite it's raw beauty, most golfers who play WRGC know we are not a Country Club with golf professionals, pro shops and maintenance crews. The people that play here are not looking for that fanfare. As owner and operator, I quite often am working on the course when golfers arrive. Frequently, I'll tell people that I sell golf "buffet style". Help yourself and I'll catch up to you at the end of your round. Wearing many hats quite often gives the perception that WRGC is a one man show, when in reality this is far from the truth. I could not possibly operate WRGC without the family of volunteers that so diligently bring this course to fruition. They are a core group of golfers that love this course and treat it as if they owned it themselves. I call them my Support Staff. Many of them have been with me for years, helping out with flood clean ups or anything else that needs to be done. All of them are Ambassadors of WRGC who care for and promote the course wherever they go. So! If you're looking to dial that stress level back and feel relaxed while playing golf, pay us a visit! You will not be disappointed. Please check our Facebook page, or give us a call.